As I began my day witha cuppa coffee and opened the Economic Times today, the smiling FACES glared at me, thinking it to be cover page story of India at 70, as I rolled my eyes down to the text was AGHAAAAST….,…. – Vedanta unlocks India’s vast natural resources to contribute to our nation’s economic strength . We also support government’ s vision with programs to empower women , educate youth and improve children’s health and wellness. All of which is transforming India for even more successful and sustainable future. Vedanta is a FTSE 250 British mining company controlled and owned by Anil Agarwal and his family through a series of tax havens and holding companies. It has become infamous for its violations of law, pollution and human rights abuses across India and Afrika. Vedanta is controlled and 69.6% owned by Brit Anil Agarwal and his family through a series of tax havens and holding companies. It was launched on the London Stock Exchange in 2003 with the assistance of the UK’s Department for International Development (DfID) and Department of Trade and Industry (DTI), who continue with their support for the company. 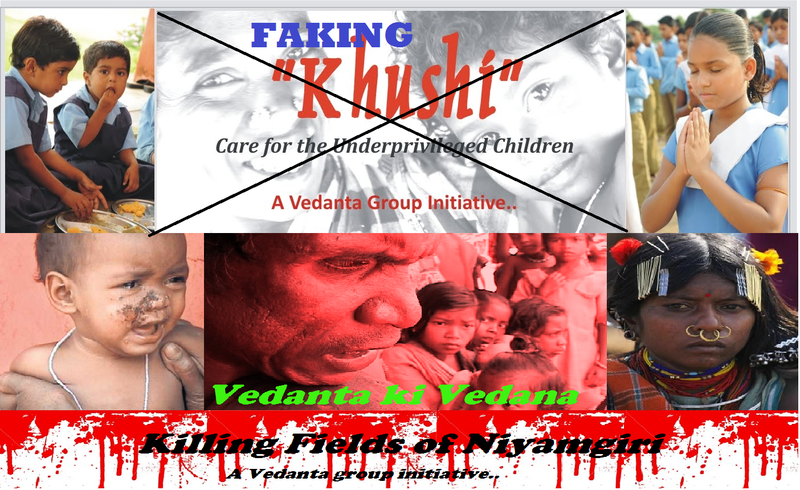 Are you aware that Vedanta’s activities are destroying the lives of thousands of people in Odisha, Chhattisgarh, Goa, Tamil Nadu, Rajasthan, Karnataka and Punjab and also in Zambia, South Africa and Australia? In Odisha, India a nineteen year struggle by indigenous communities, Dalits and farmers led to a historic victory in 2014 when Vedanta was stopped from mining the sacred Niyamgiri hills for bauxite. Vedanta’s attempt to secure the mountain through State Owned OMC was rejected by the Supreme Court again on May 6, 2016. Vedanta Aluminium Ltd had built the 1 mtpa Lanjigarh refinery at the base of the Niyamgiri hills in 2004, and even expanded it six fold, despite having no permission to mine bauxite from the hills above. Vedanta’s launch on the London Stock Exchange in 2003 was based on the impression given to financiers that they had permission to mine Niyamgiri. The harassment of tribal activists who succeeded in stopping Vedanta’s bauxite mine in a precedent referendum in 2013 is increasing, and key activists have been jailed and tortured this year, accused of being Maoists. Niyamgiri Suraksha Samiti (NSS) and the Dongria Kondshave held major blockades of Vedanta’s refinery in reaction demanding an end to harassment and the decomissioning of the refinery. In Korba, Chhattisgarh, India between 40 and 100 workers died at Vedanta subsidiary BALCO’s aluminium smelter complex when a chimney under construction collapsed on them in September 2009. The subsequent judicial inquiry into the incident found Vedanta guilty of negligence and using sub-standard materials and construction methods. However, Vedanta’s lawyers suppressed the report which was leaked by activists in 2014. In Goa, India, Vedanta’s iron ore mining subsidiary Sesa Goa (now Vedanta Limited) was the largest company indicted by the Shah Commission in 2012 for illegal mining, including failure to obtain leases or environmental clearance, and exporting 150 million tonnes of iron ore from Goa in 2010/11 while only declaring 76 million, their agreed export allowance.The resumption of iron ore mining by Vedanta subsidiary Sesa Goa has already led to protests by Gowda Adivasis (a tribal group) suffering from air and water pollution, and accusations that the company is already exceeding its quota and continuing illegal mining under the guise of removing waste dumps. After being found guilty of widespread illegal mining Vedanta is already demanding that the resultant cap on mining is lifted. In Jaipur itself Vedanta is accused by an employee’s union of casualising and de-unionising the labour force at Hindustan Zinc Ltd by reducing permanent workers to only 2,500 of 18,000 workers. The Maton Mines Mazdur Sangh (Maton Mines Workers Union) is also opposing Vedanta for poor working conditions and destruction of crops and houses around their phosphate mines. Meanwhile, on 11th May 2016 Anil Agarwal promoted Sterlite Technologies announced its successful bid to to run a second ‘smart city’ project in Jaipur. Vedanta’s Sterlite Copper operations in Tuticorin received flak for its disposal of hazardous wastes, impacts on ground water and public health over two decades, besides its disregard for government rules and regulations. The 4 MTPA plant is located next to the ecologically sensitive Gulf of Mannar region on Tamil Nadu’s coast. In 2010, the Madras high court ordered the closure of the copper smelter, on the grounds of excessive pollution, poor mitigation and waste disposal, and for violating directives of the Pollution Control Board (PCB). On March 28, 2013, the Tamil Nadu Pollution Control Board shut down the factory after reports of a gas leak comprising extremely high levels of sulphur dioxide in the air, which led to the death of a 35-year-old migrant factory worker. India’s Supreme Court, however, stayed the high court’s decision to shut down the plant. It instead imposed a penalty of Rs 100 crore on the company as a deterrent and directed the PCB to impose stricter mitigation measures. Vedanta informed the council that it was complying with all these new directives. However, the council still outlined a host of unaddressed issues – from overstating the land available for pollution control measures to failing to dispose of large quantities of gypsum still contained in its waste pond (corroborated by Google Earth Images from 2016 and interviews with local communities). It found that BALCO had yet to follow up on its own 2008 epidemiological health study, which found that people around the factory site were suffering from skin and respiratory disorders. In Karnataka the Bellary region became ‘a republic of lawlessness’ with clearances for 82 million tonnes of iron ore per year issued and controlled largely by mining barons and State government ministers the Reddy brothers, Thousands lost their farmland and homes to mines and nothing could be grown in the dusty and polluted fields. When mining was eventually banned thousands of miners returned to their former livelihoods in farming. Interestingly revenue for the State even increased after the ban, showing the degree of looting taking place. In Zambia, Vedanta has appealed against a precedent May 2016 judgment allowing thousands of farmers suffering eleven years of pollution by Konkola Copper Mines (KCM) to have their case against the company heard in the UK. During the London appeal hearing they claimed no connection between the parent and subsidiary, stating that corporate governance reports were just for show to comply with London listing rules. Meanwhile the pollution goes on in Zambia, where Vedanta have also been found guilty of widespread transfer mispricing and tax evasion according to a recent UNCTAD report. KCM have never published their annual accounts. 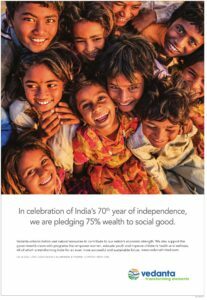 Vedanta has been attempting to create favourable public opinion by sponsoring International Film Festival of India (IFFI), the Our Girls Our Pride gender project and even the oxymoronic Mining Happiness campaign, using celebrities and media houses to hush up its liabilities. But each of these attempts has been exposed by grassroots groups and people’s movements pointing out Vedanta’s corporate crimes using social media and letter writing.